As one of the most popular mobile chat services, AirG offers thousands of chat rooms on its mobile community to cater to users of all regions, interests, and pursuits. AirG chat rooms require a free account, in addition to mobile Internet access. An unlimited data plan is recommended for chat room use on AirG. 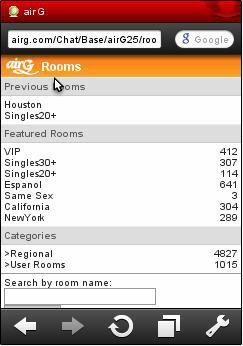 By definition, AirG chat rooms within the Featured Rooms category typically carry the largest number of users on a regular basis. These rooms are highly recommended for users with a good grasp of how to use AirG chat rooms, and able (or willing) to deal with a larger general audience. As the name suggests, the Regional Chat Rooms subcategory includes a myriad of topics separated by geographical, racial and age groups. Since these AirG chat rooms are aimed at smaller niche audiences, discussions are often more focused than those in the Featured Rooms section. Communities develop within these rooms, yet are still open to new users. These rooms are recommended for users looking to make new friends or those looking for AirG chat rooms focused on a specific topic. The AirG chat rooms which comprise this subcategory are the most limited in focus and have the least amount of users on a regular basis. Users can create your own AirG chat room, or join another previously created. These rooms are good for users who are looking for a more specific niche not filled by AirG's Regional chat rooms. AirG users should be made aware of the significant number of sexually explicit topics found in User chat rooms; content could contain adult material not suitable for some audiences. Furthermore, some AirG chat rooms in this category, including those in which members engage in role playing games, can be hostile to new users "invading" their territory. Tread carefully! Ready to Explore AirG Chat Rooms? Learn how to use AirG chat rooms with this tutorial.